Ricky Ponting will pull on his baggy green cap for his eighth Ashes series on Thursday, once again assuming the burden of his nation's conviction that Australia should not lose to England. At anything. Ever. 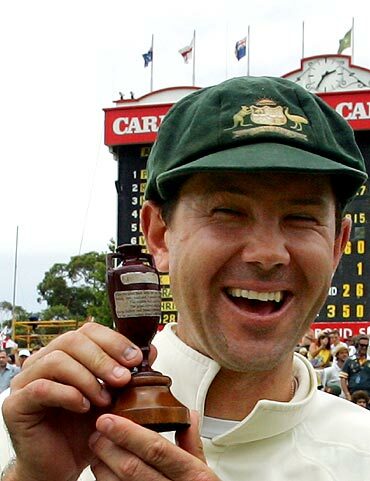 The most prolific Australian batsman and one of the most successful cricketers of all time, Ponting is facing the unthinkable over the next six weeks -- becoming the first Australian captain to lose three Ashes series. If his 15 years as a Test cricketer have jaded him, though, or the weight of expectation dulled his enthusiasm for the fight, the 35-year-old hid it well when he spoke to reporters on the eve of the first Test in an overcast Brisbane. "It doesn't matter at all what happened in the previous series, what matters is what happens tomorrow morning and the next few weeks that I'm most concerned about," he said on Wednesday, leaning forward to emphasise the point. "Our group's been very good over the last few days... the feeling around the group is great, there's a lot of confidence about the group. "We've done enough talking, enough training, enough preparation, it's game time and we're all excited about that." 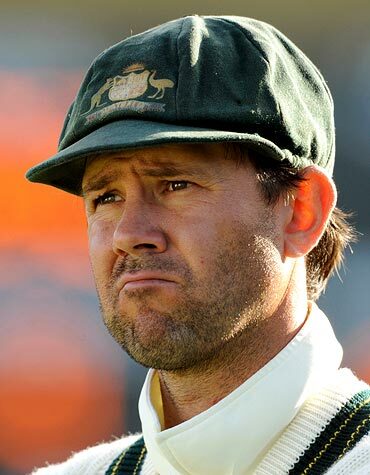 Ponting has never been perceived as a great captain, even in Australia, with criticism of his leadership increasing as retirement robbed the team of greats like Shane Warne, Glenn McGrath and Justin Langer. The Tasmanian is a captain who has continued to lead by example, however, and, he said, that is why so many of his 39 centuries have come in the first innings of a match. "I think it's to do with the challenge that you are confronted with as an experienced player, as a top order batsman, as the leader of your team," he said. "I've always focused that I'm right for that first innings of the series, I've always felt I've got a big say in how the series develops after my first innings of the series. "Looking back at the last Ashes series here, I think I made 196 in the first innings ... it just felt that I'd given my best to help the team set up the series. "Hopefully there's another 100 round the corner tomorrow." The 196 in Brisbane four years ago is a reminder that Ponting has been under pressure before, and come through in style. Questions were already being asked about his captaincy before the team's plane touched down after the 2005 Ashes defeat and Ponting was continually under fire until a confident England side pitched up in Australia for the 2006-07 series. The result? 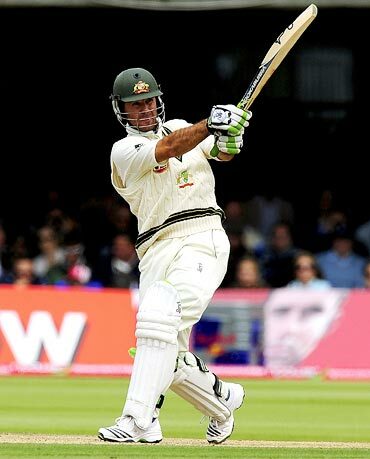 Ponting led Australia to their first Ashes cleansweep in 86 years and was named player of the series after scoring 576 runs, including two centuries, at an average of 82. Much of the motivation for that ruthless victory came from England's champagne-drenched celebrations in 2005. Ponting is hoping to use the same method to spur on the 10 players in his team who were at the Oval when England paraded the Ashes again last year. "I made sure that it hurt them as much as possible when the Ashes was being handed over," he said. "And there's no doubt that that is what's been driving me, and every one of the players. It's about that empty feeling we had in our stomachs after walking off the Oval after two successive Ashes tours. "We want to make sure we never have that feeling again, and all our hard work has been based around making sure that we can play Test cricket for five days in every Test match to the best of our ability. "And if we do that, I'm sure you'll see some results come our way." The first Test of the five-match series starts at 10:00 local time (0530 IST) at The Gabba on Thursday.